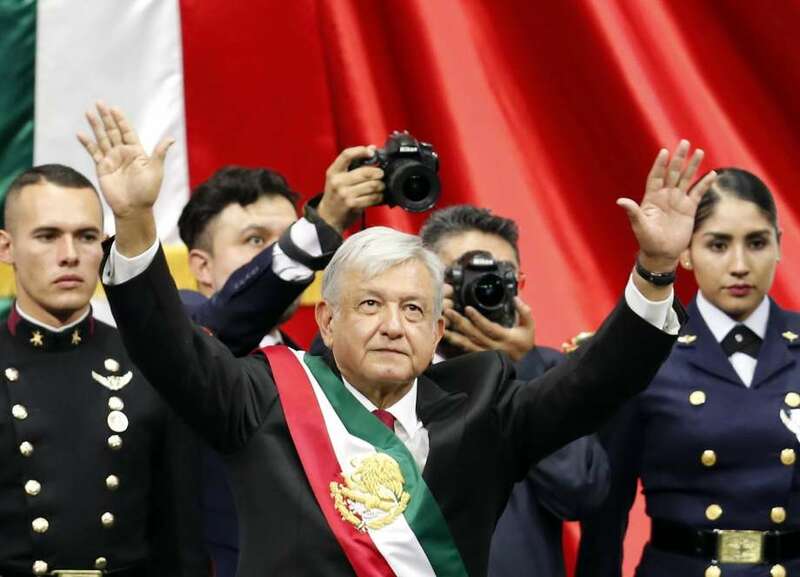 Mexico's new President Andres Manuel Lopez Obrador greets the crowd at the end of his inaugural ceremony at the National Congress in Mexico City, Saturday, Dec. 1, 2018. The Mexican government has cancelled bidding on two auctions that would have allowed hydraulic fracturing in the border state of Tamaulipas and brought more foreign oil companies south of the border. Mexico’s National Hydrocarbon Commission announced late Tuesday afternoon that it was cancelling its Round 3.2 and Round 3.3 auctions and postponing farmouts with national oil company Petróleos Mexicanos. The Round 3.2 auction included 37 blocks for conventional oil & gas projects in the states of Nuevo Leon, Tamaulipas, Veracruz and Tabasco while Round 3.3 auction had nine large blocks that were reserved for hydraulic fracturing projects in Tamaulipas. The move comes less than two after Mexico’s new president Andres Manuel Lopez-Obrador was sworn into office. The leftist and populist president had previously vowed to ban fracking in Mexico and said that he favors suspending any new bidding on energy projects for three years. Lopez-Obrador previously said that he wants to see whether or not private companies are delivering on projected investments and production under Mexico’s historic 2013 energy reforms. The reforms ended more than seven decades of a monopoly by Mexico’s national oil company Petroleos Mexicanos. Several rounds of bidding ended with concessions to foreign companies and newly formed private companies from Mexico. Lopez-Obrador claims that the reforms have not resulted in much investment or oil and natural gas production to date.